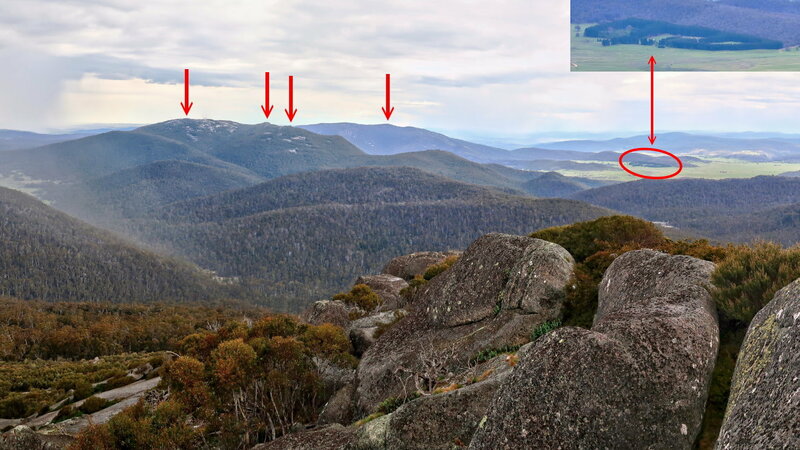 I have compiled a list of named peaks in ACT above 1700 meters. There are 13 of them. And I am in the process of climbing them all. 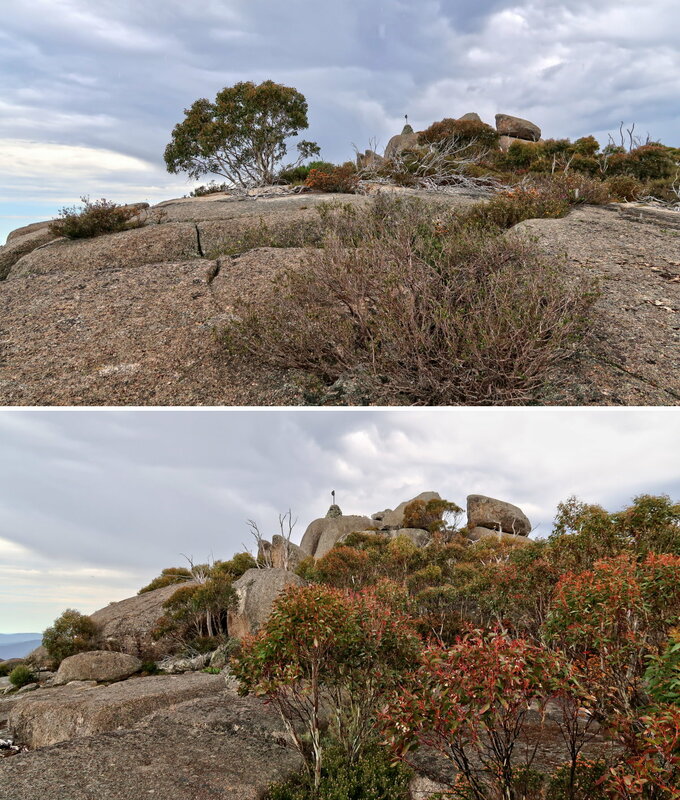 I still have Mt Murray and Mt Scabby to tick off. Contact me if you wish to join in to climb these two ... hhmmm ... or any other mountains. Trip report is under construction. 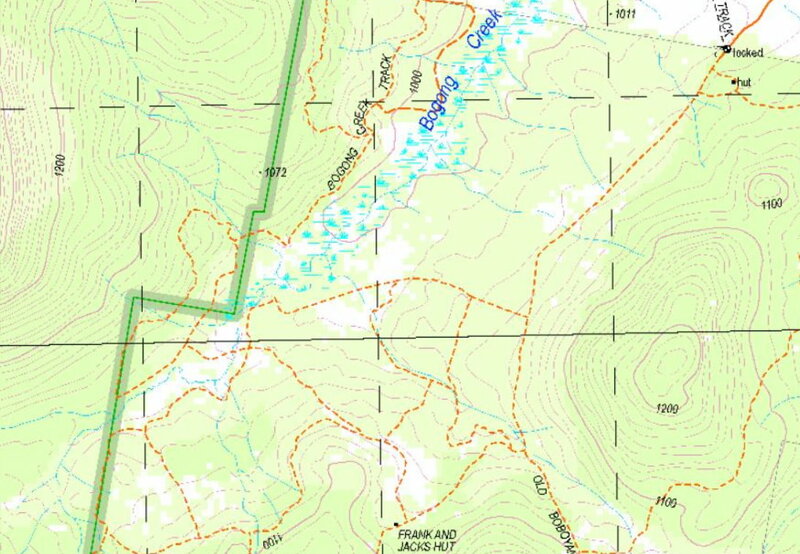 Today's climb, with DH, is to Mt Gudgenby, 1739 meters. In my list above, it is the 9th highest named peak in ACT. It took DH and I 11 hours for the return trip. We are slow. Fast climbers can complete it in 7 hours. This one is continuation to the right of previous map. 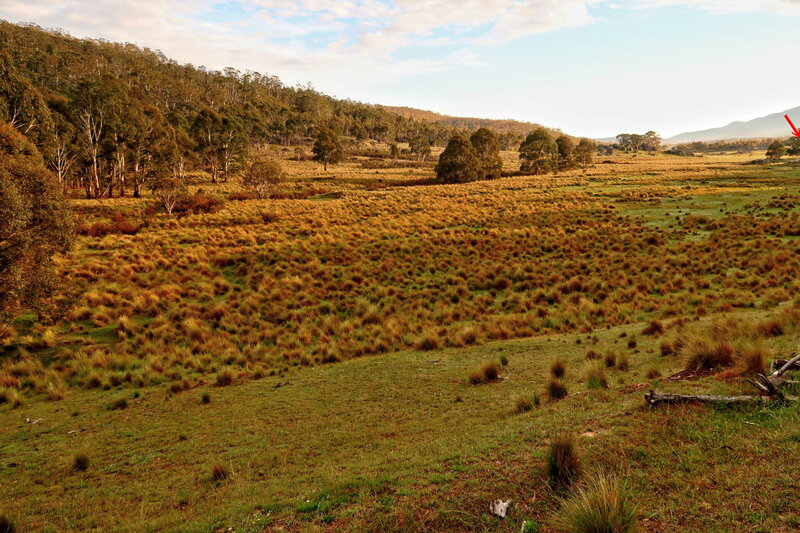 The starting point of the Mt Gudgenby climb is at Yankee Hat Carpark on Old Boboyan Rd. - Start at Yankee Hat Carpark. - Walk on Old Boboyan Rd. - After 1.4 km, turn west into a forest road. 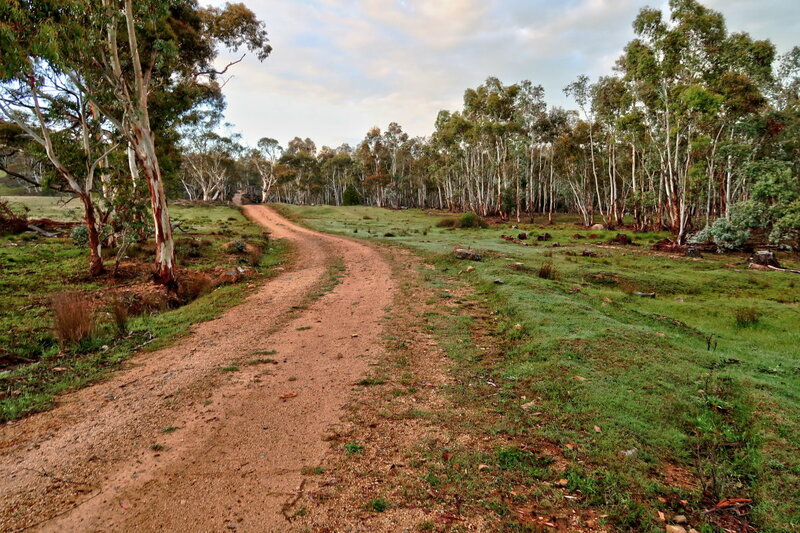 - After another 2.25 km, go off-track to climb Mt Gudgenby. 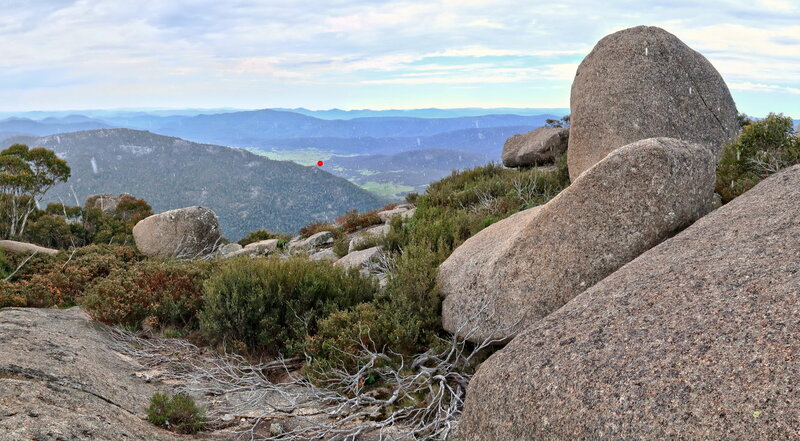 - After climbing Mt Gudgenby, explore a pile of boulder nearby (just north of the summit). - Retrace our steps back to Yankee Hat Carpark. Unbeknownst to us, DH is standing on a bull ant mound, the red oval. Not long afterwards, he is bitten all over and has to strip naked to get rid of the ants crawling all over his body, inside the clothes ! An advice to anyone reading this blog post ... do not park your car near that spot ! - Time now is 5:34am, just before sunrise at 5:45am. 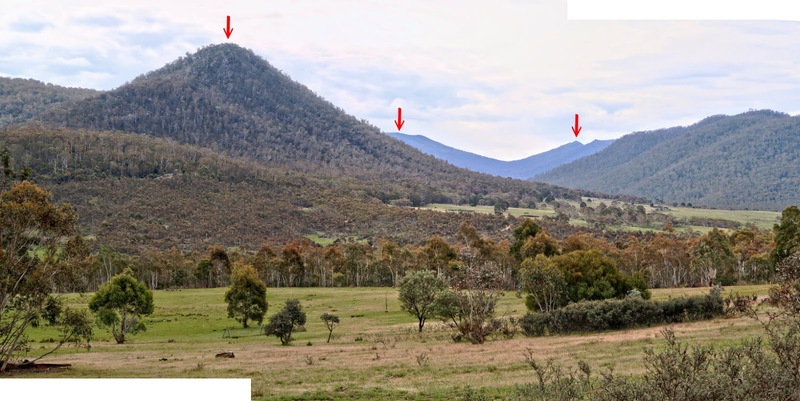 - Mt Kelly is just blocked by the slope on the right side of Yankee Hat. - Middle Creek flows in the valley to the right of Yankee Hat. - Time now is 5:49am, just after sunrise at 5:45am. 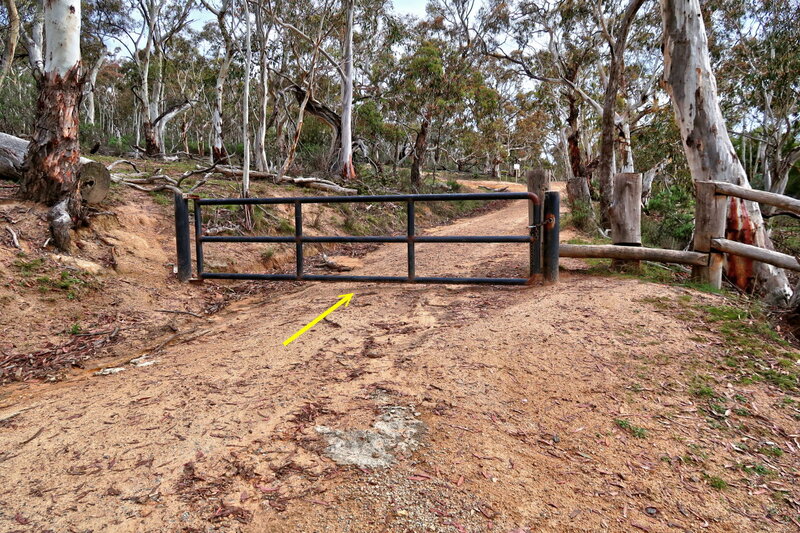 4) Yankee Hat Carpark is just by the side of this locked gate. 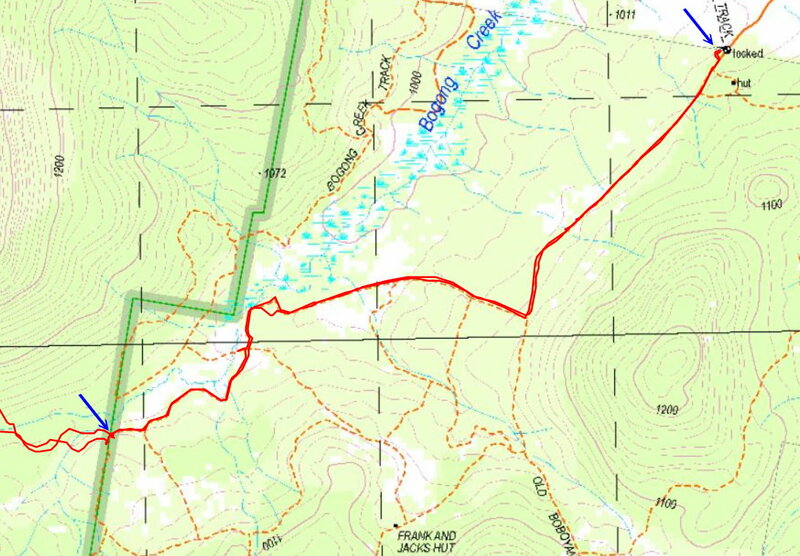 Initially, we'll be walking on Old Boboyan Road, in the direction of the yellow arrow, to Mt Gudgenby. - Yellow arrow: We've just turned right (west) into the forest road; and are going to walk along the direction of the arrow. 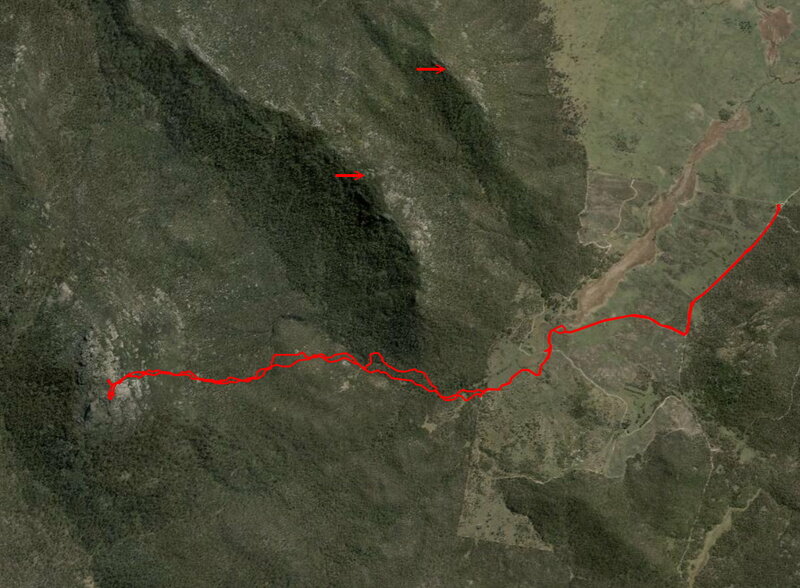 - Yellow dots: Later on, our route to Mt Gudgenby is along the yellow dots. • Yellow arrows: The forest road we are going to walk on. 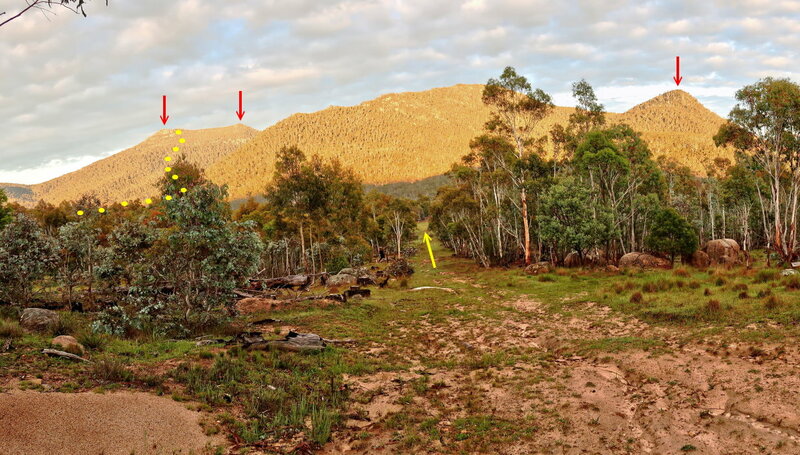 • Yellow dots: Bushbashing route up the Mt Gudgenby slope. • The large mountain to the left of Yankee Hat is unnamed. The highest peak there is 1558 meters. • Yellow arrow: We walked along the forest road to here. 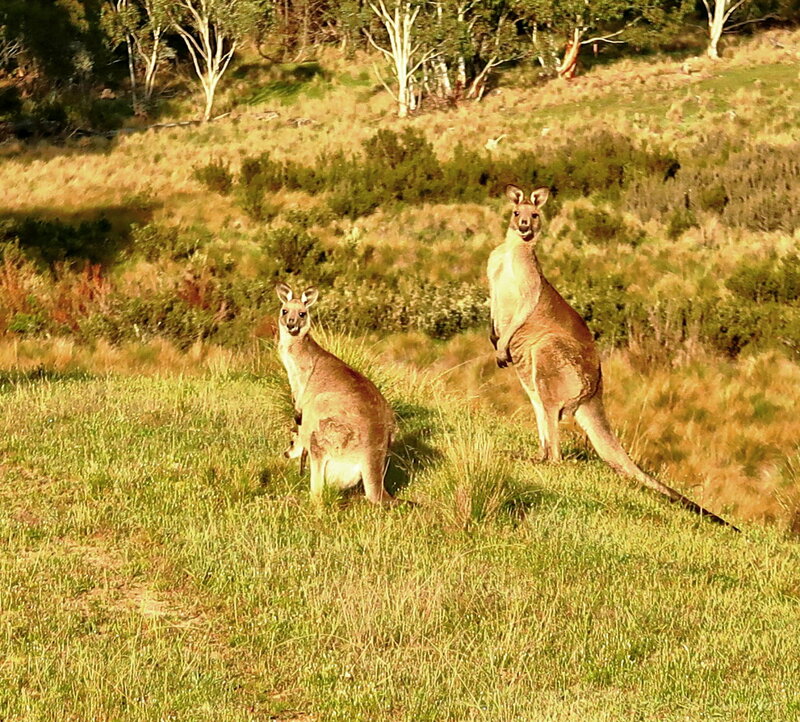 The one on the left has a joey with its head and tail sticking out of its mother's pouch. - Yankee Hat Carpark can't be seen from here. But the red arrow points to where it should be, well behind the trees. - This area used to be a farmland. 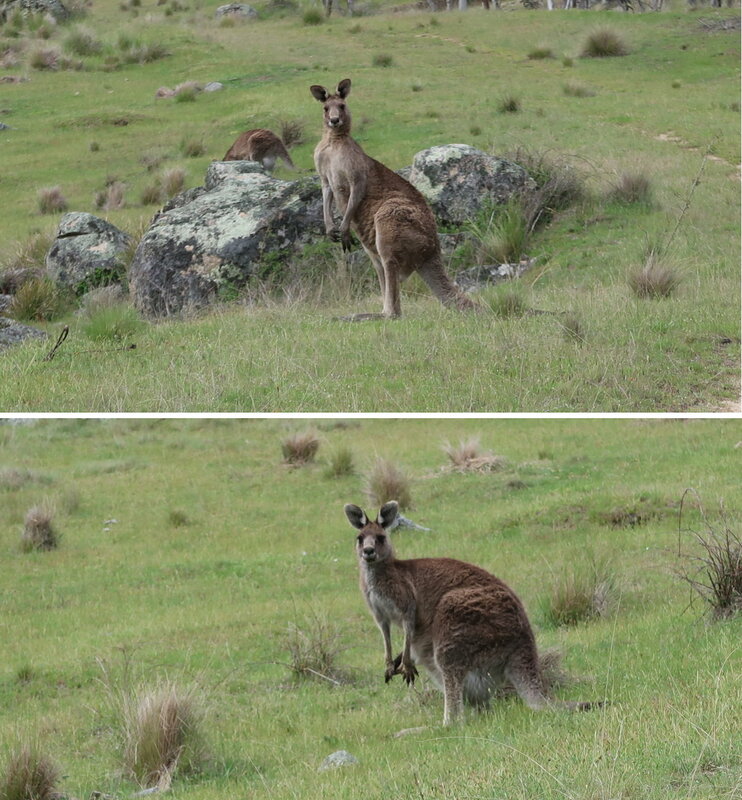 It is now part of Namadgi National Park. 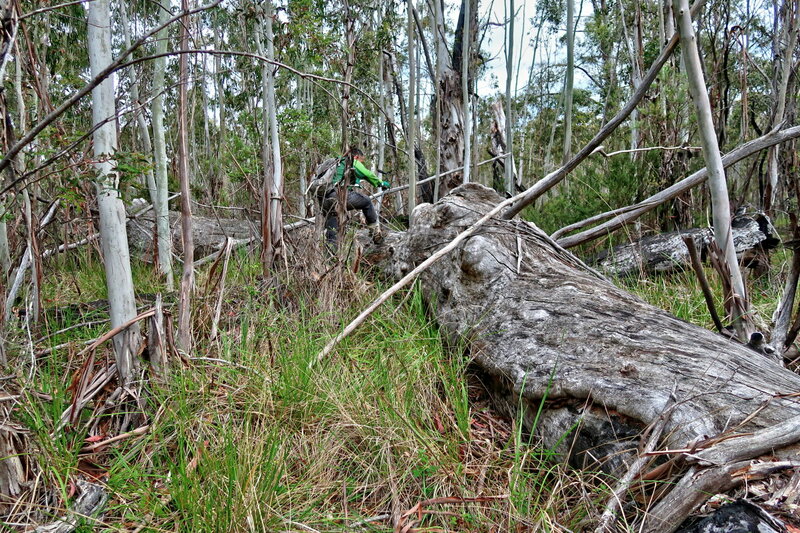 Soon after the previous pic was taken, we go off track and bushbash up the slope of Mt Gudgenby. 10) There are some creek crossings. DH is crossing one of them now. 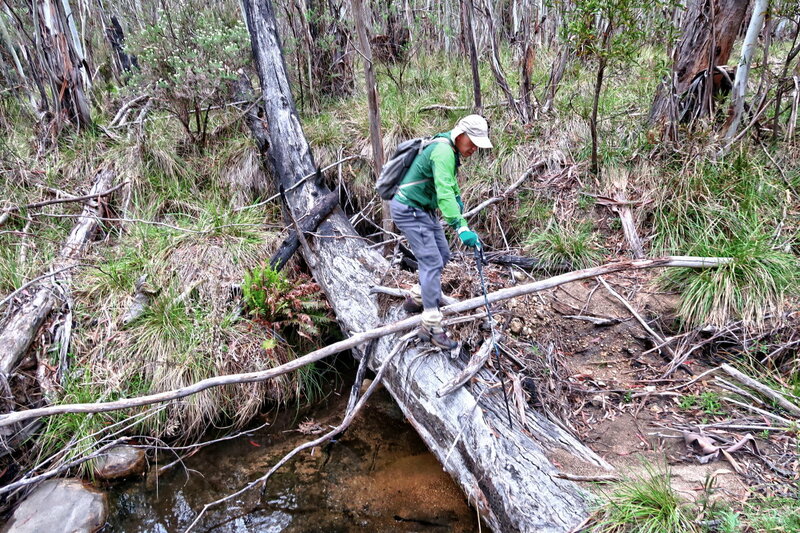 All the creeks are easy to cross. You won't get your boots wet. 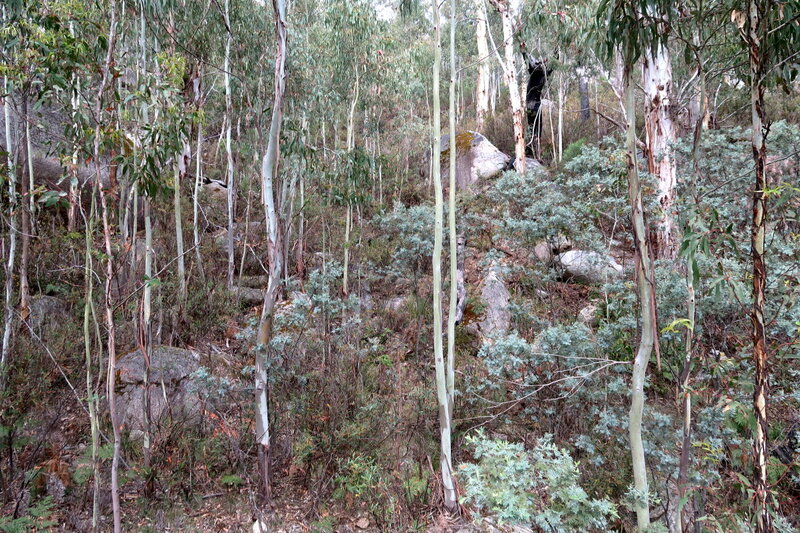 In many areas, the scrub is much denser than here. Not as dense as to Mt Kelly and Mt Namadgi, but still, it is thick enough to make you want to cry. 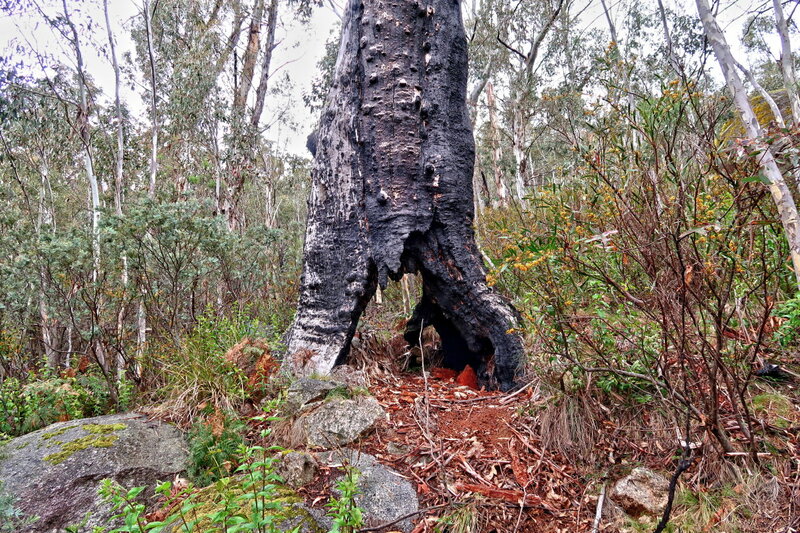 12) Occasionally, there are lone burnt out trees trunks. This one stands out because of the large hole right through its base. 13) Occasionally, we come to a rock slab. That is a godsend as then we have a few meters of clear path without bashing through the annoying scrubs. 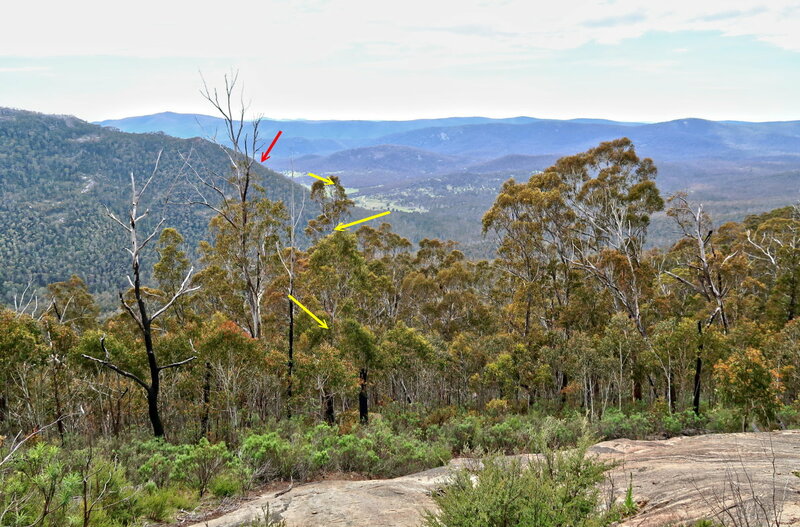 - Yellow arrows: Roughly the way we climbed up to here. 17) We are quite close to the top of Mt Gudgenby. Here we encounter tangled messes of tree trunks. - The summit is behind the rocks in the background. - In the 4 pics below, the two right side pics are the continuation to the right of the left side pics. 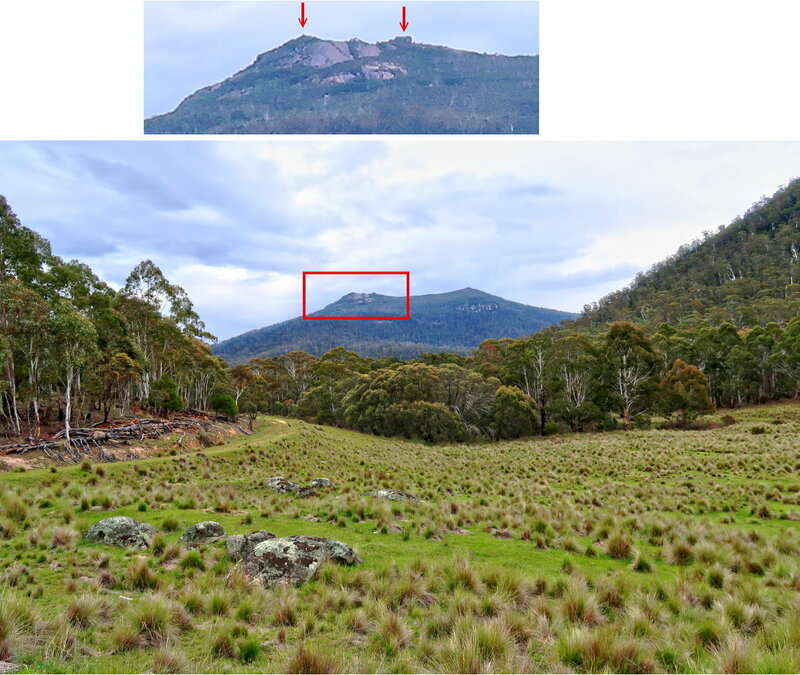 18) 5 hours after we started walking, we can see the summit of Mt Gudgenby ... refer to the lower pic. - The big boulder on the right side of the pic is the same big boulder as in the previous pic. - Some white streaks in the pic are due to rain drops. There is a short light shower right now. It lasts for a few minutes only. We soon discover the boulders just beneath the summit are too large and steep for us to climb over. So we turn right to go around the base of the summit to find a way up. 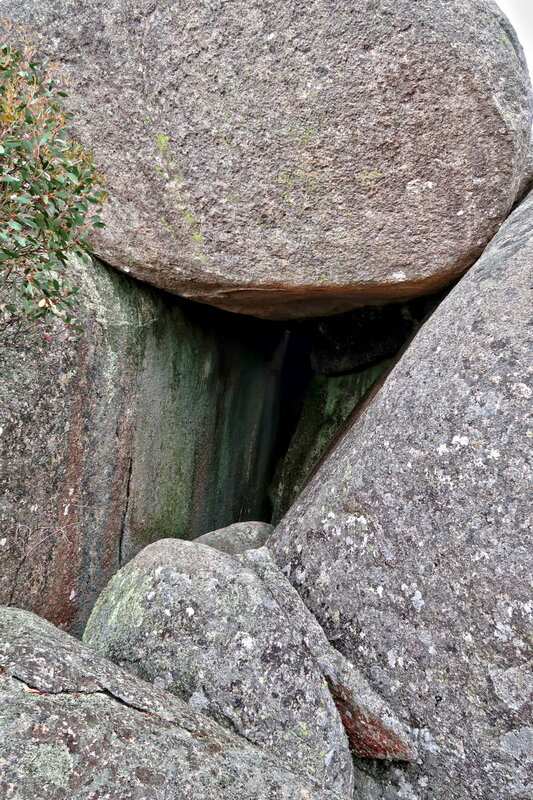 21) While circumnavigating base of the summit, we pass by these boulders which form a nice shelter from rain and wind. 22) It is not so easy to circumnavigate the base of the summit. Most of the time, we are either scrambling over boulders or hopping over the top of them. Once we need to crawl through this hole. 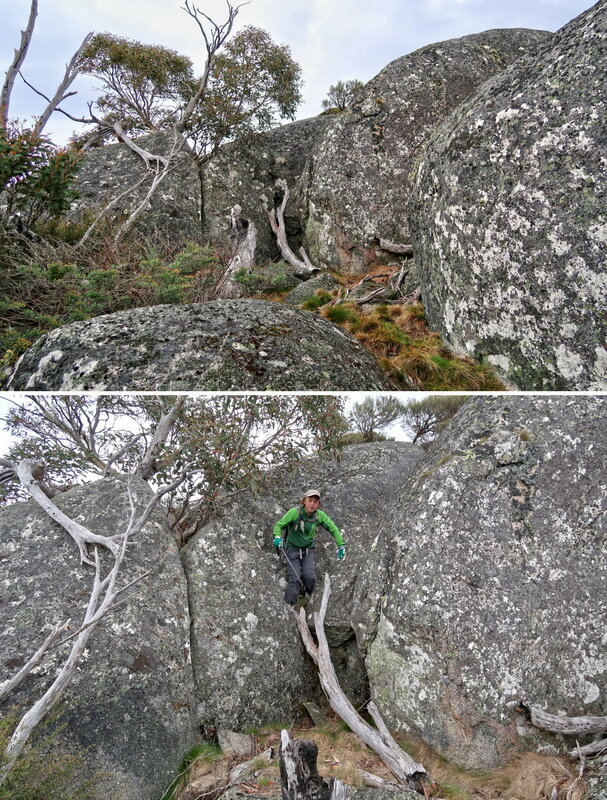 - Upper pic: At last, we climb up some boulders and find ourselves here. - Lower pic: It looks like a promising way to proceed to the summit ... by climbing up the dead tree trunk, as DH has done here. 24) I am now at where DH was in the previous pic and looking up. - Red circle: This is the top of the dead tree trunk in the previous pic. - Yellow arrow: Climb up along the gap there and we'll be at the summit. 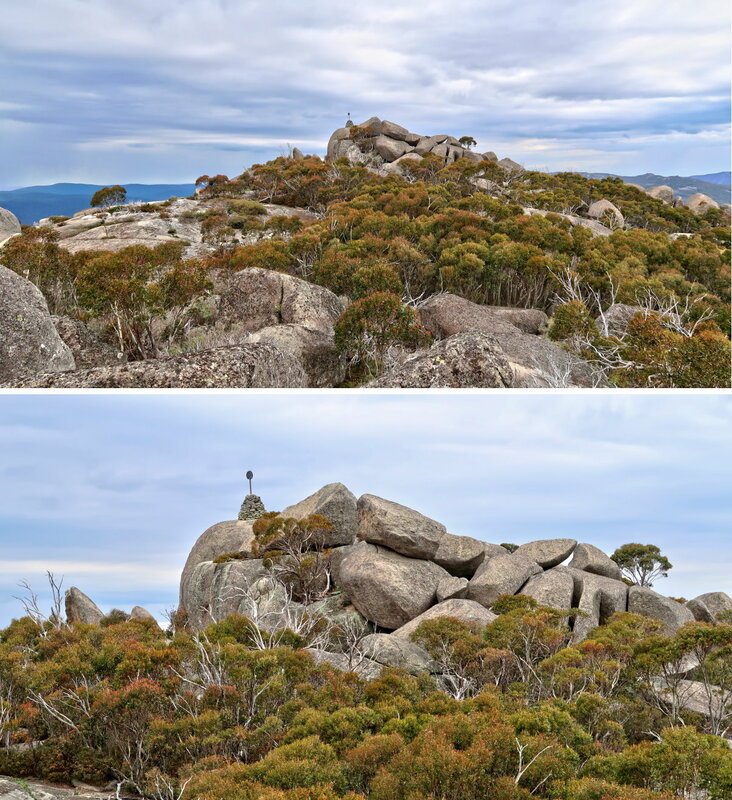 Once we climb to the top of the gap of the previous pic, we are at the summit of Mt Gudgenby. 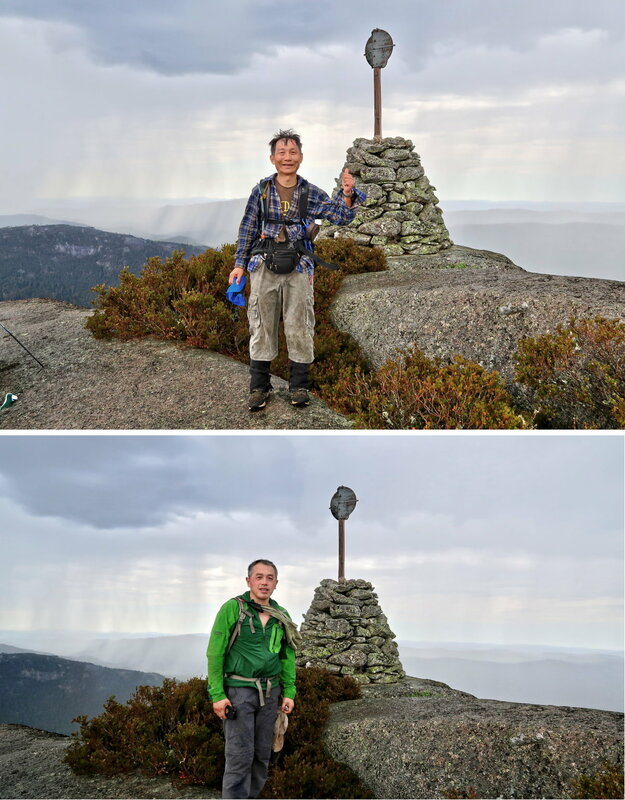 25) It took us 30 minutes from photo #20 to here at the summit, an indication that the boulder scrambling/hopping around the base of the summit wasn't all that easy. If at photo #20, had we turn left instead, maybe it would only take a few minutes to reach here. Showers are at the background but not here at the summit. 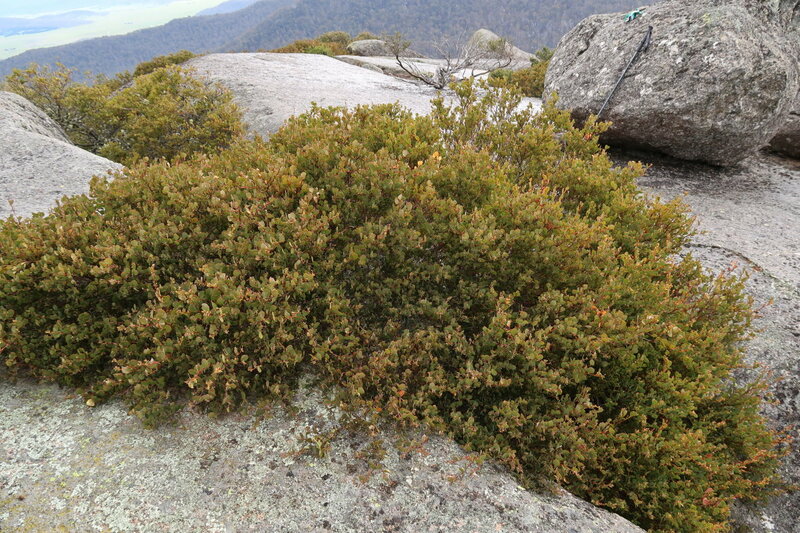 27) Typical low lying plant at the summit of Mt Gudgenby. Any one know the name of this plant? 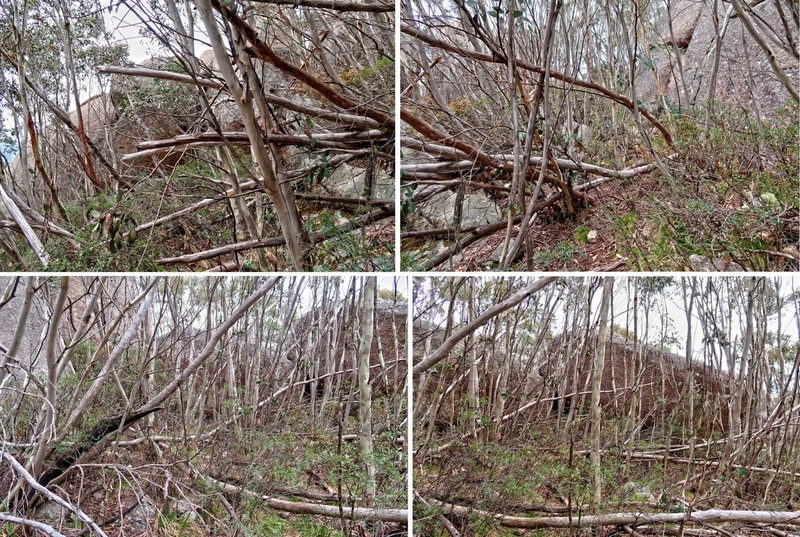 The next 3 photos (#28 to #30) form a 360-degree panorama. 28) Weather forecast is for showers at 3pm. However the rain came early as it is only 12pm. 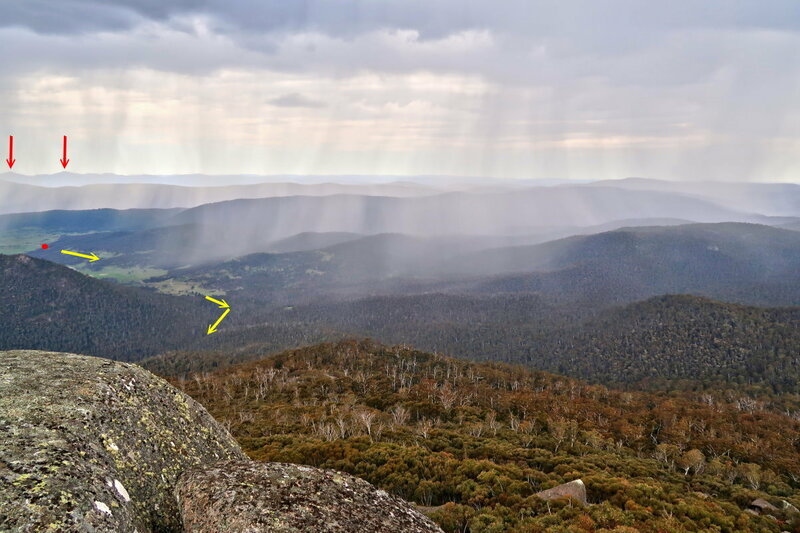 We can see showers very close by, to the north and east, but not here at the summit ... How lucky can one be !?! - Photo #31 zooms into the middle part of this pic. 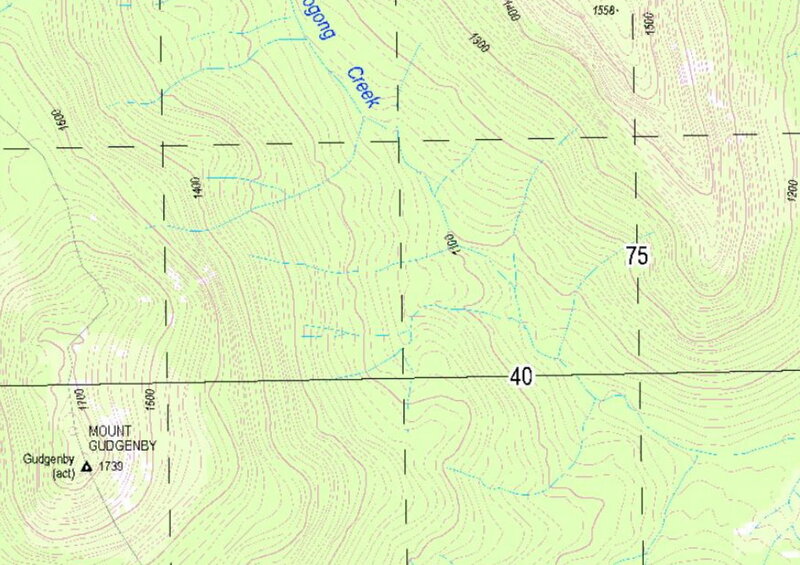 - Red oval: Nalyappa Homestead (see also photo #31) ... 2 and a half years ago, in 2015-05, I climbed Yaouk Peak from there. - Photo #32 zooms into the left half of this pic. 5 Mt Gingera ... Refer to photo #32 and #33 for a better view of it. - Continuation to the right of this pic is photo #28, thus forming a 360-degree panorama. 5 Nalyappa Homestead ... 2 and a half years ago, in 2015-05, I climbed Yaouk Peak from there. 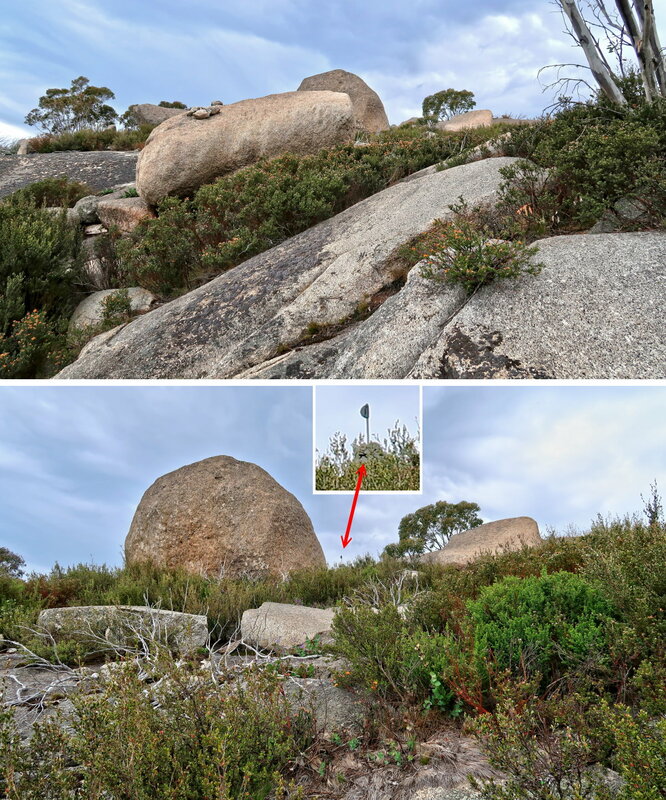 - Red circle: A pile of boulders nearby (north-ish) ... See photos #33 and #34. 5 Mt Gingera ... It pokes its top just barely out of the hill in front of it. 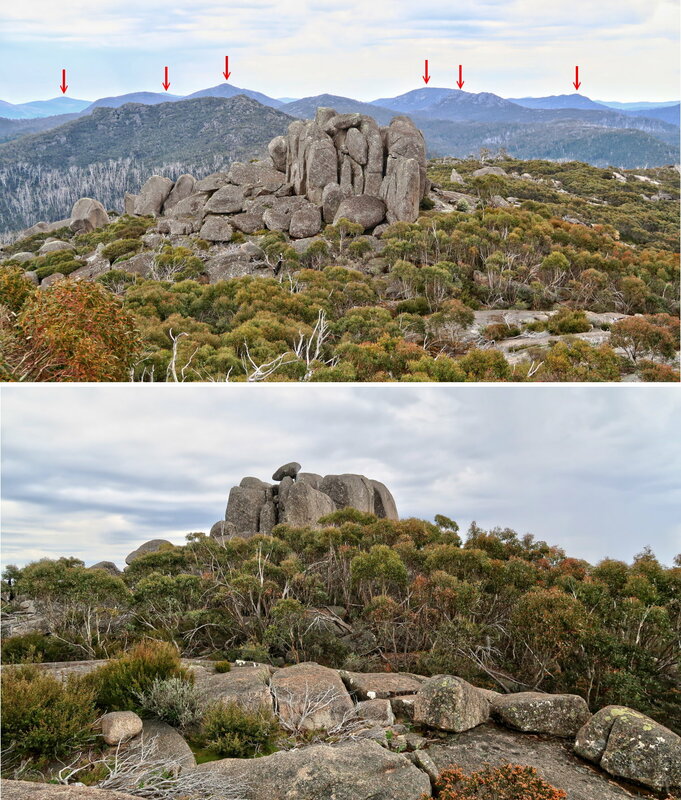 - The peak in front of Mt Kelly and the peak between Mt Kelly & Mt Namadgi are unnamed peaks along Scabby Range. We have lunch at the summit. 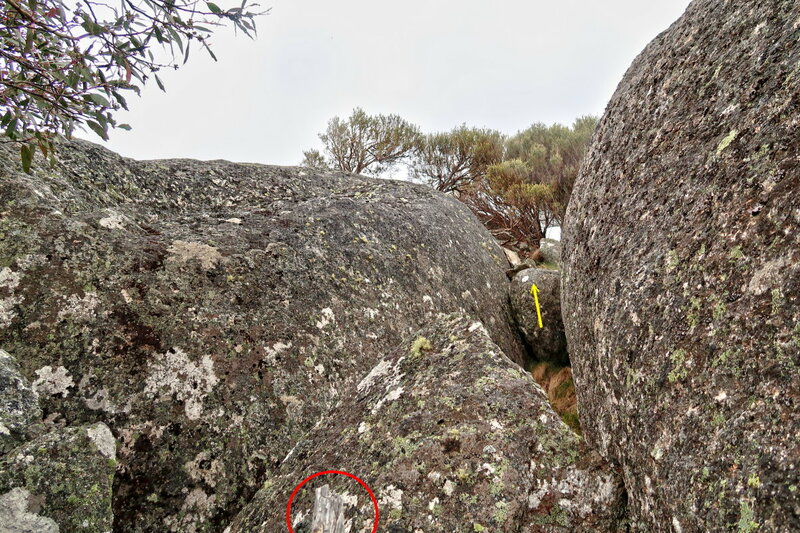 Then it is to climb down; and visit the pile of boulders (red circle in the previous pic). 2 Mt Gingera ... Its top just barely poking out of the hill in front of it. 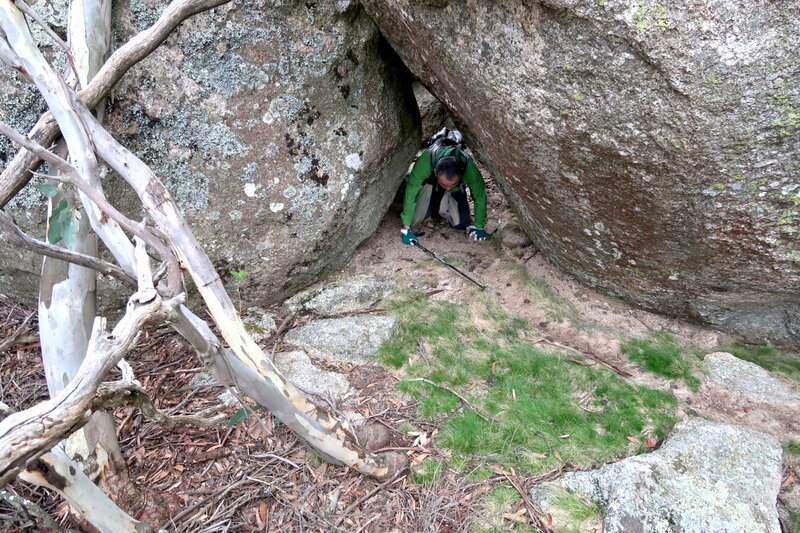 34) I explore the left side of the pile of boulders to check whether it is possible to climb up. DH stayed behind and didn't go with me ... He is probably a bit tired. 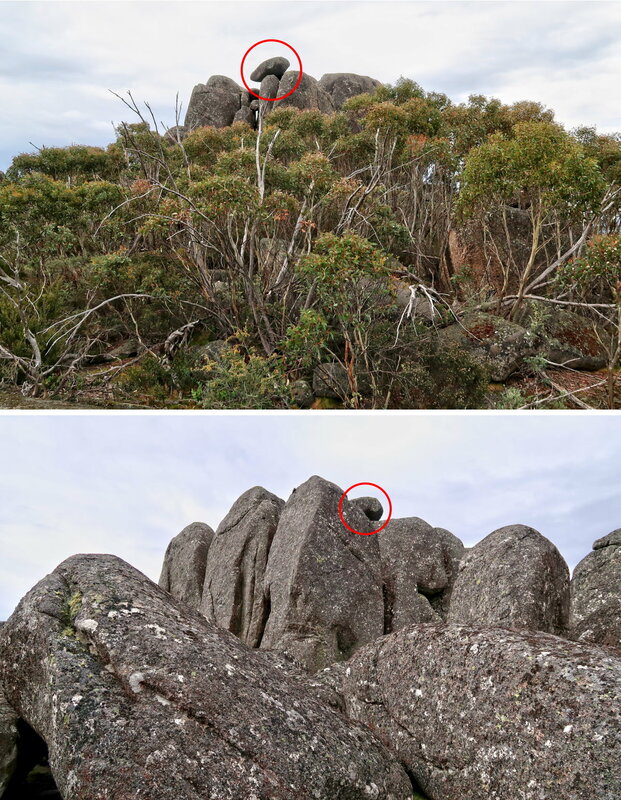 - Red circles in both pics below: They are of the same rock. 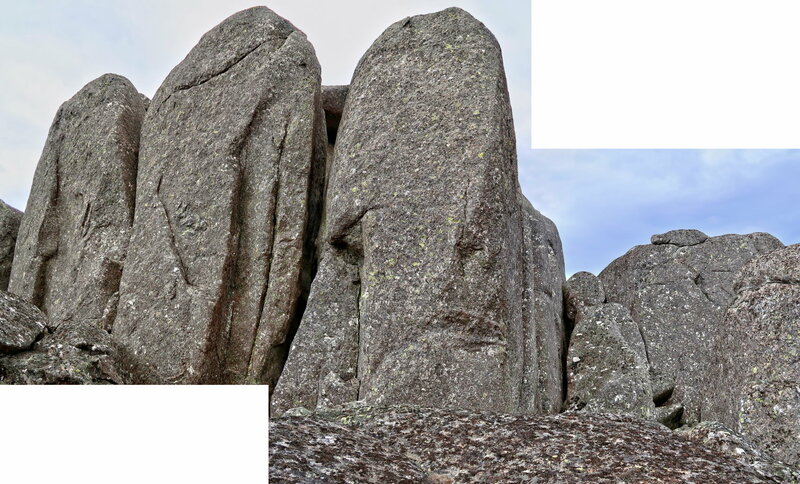 The 3 tall boulders here can be seen clearly in the previous pic too. 36) Going further along to the left side of the previous pic, I come to this gap. 37) I have climbed down the pile boulders; and taking a final look at it ... it is pretty handsome looking !!! I didn't explore the right side the boulders. DH has an eye condition which makes him difficult to see at night. And he forgot to bring a pair of corrective glasses which would assist him in this aspect. As he is the driver, he would like to climb down the mountain earlier to minimize the amount of night-time driving. 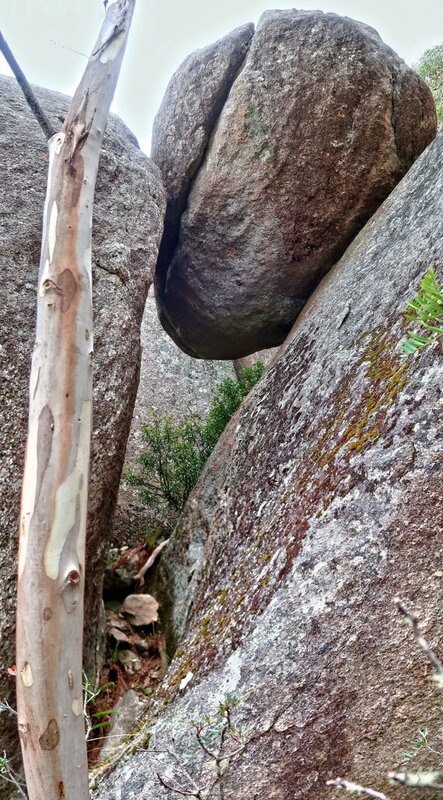 And so, after reaching the top of the gap in photo #36, it is time to climb down Mt Gudgenby. 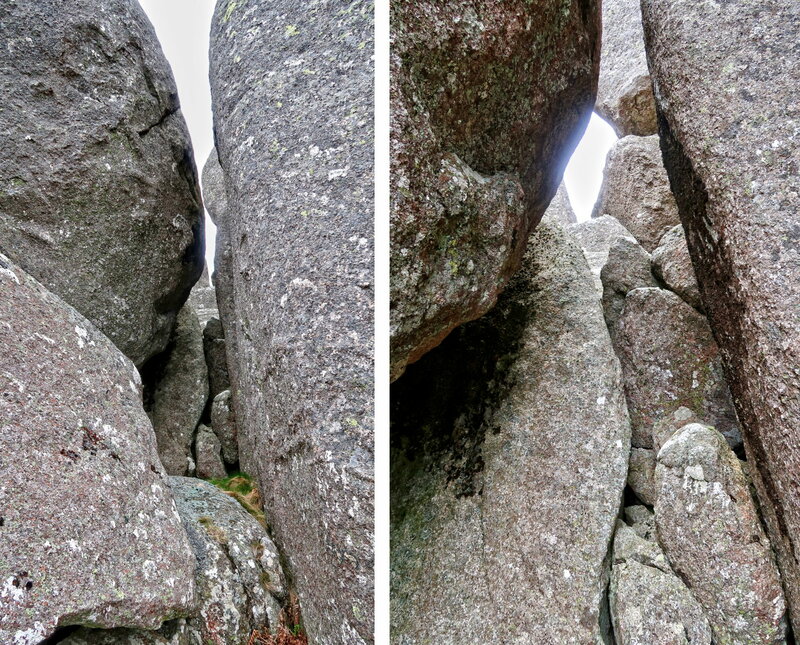 If you have found a way to reach the top of the boulders (photos #34 / #37), please let me know. 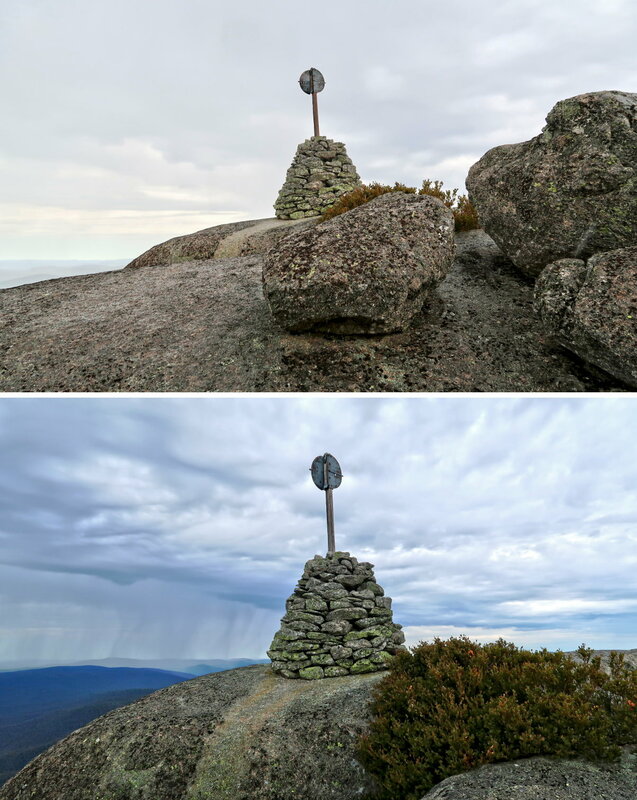 I wouldn't mind visiting Mt Gudgenby again to climb it. 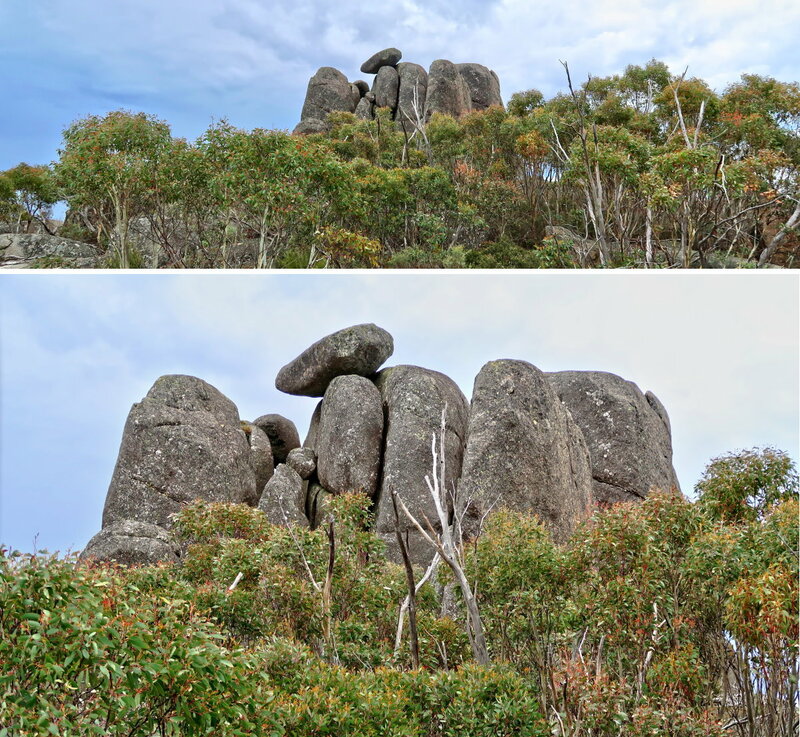 PS: Nick Anderson informed me that in https://www.subw.org.au/2016/04/01/mt-gudgenby/ there is a photo of a guy at the top of these rocks. Ah well, I need to make a trip to there again. We climbed up to the summit from behind the back of these boulders. In many areas, the scrub is much denser than here. 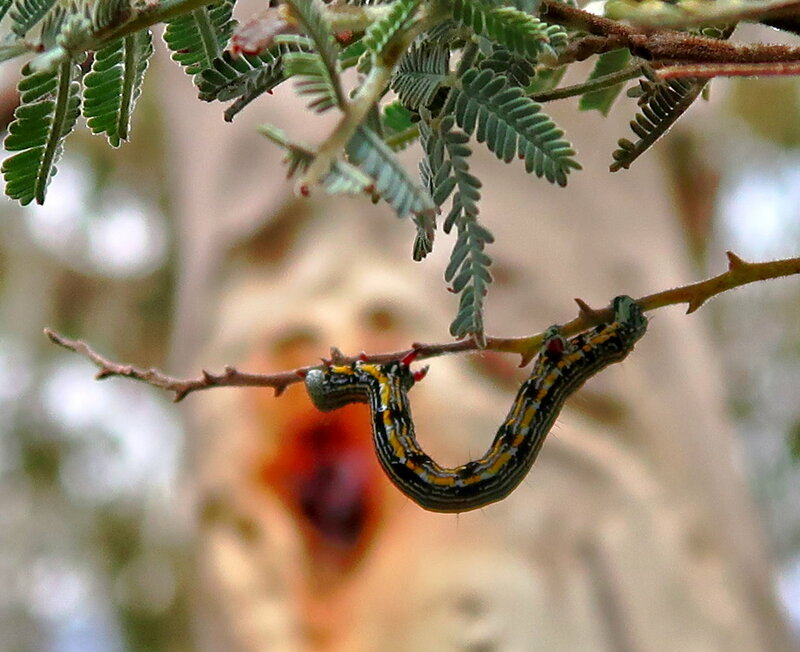 40) If you know the name of this small caterpillar, please let me know. 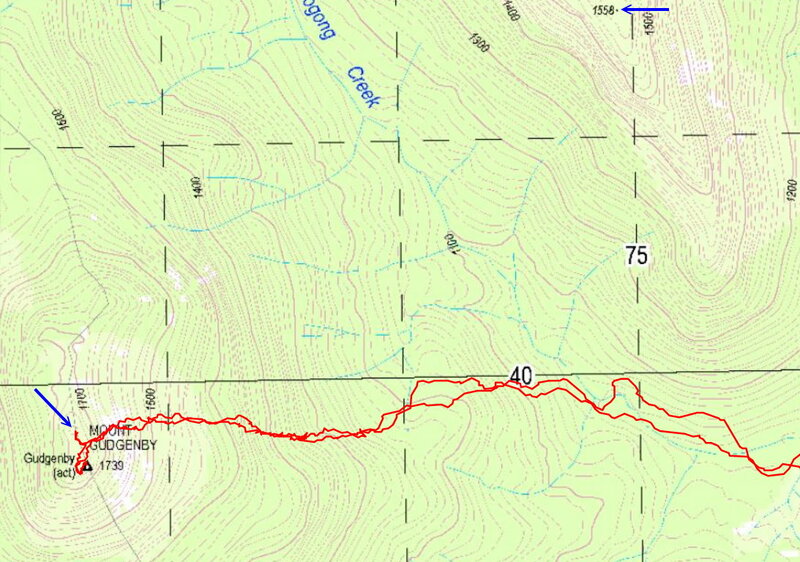 41) We've finished climbing down the slope of Mt Gudgenby. We've also finished all the bushbashing and off-track walking and is just back on a forest road; and taking a rest. While having a rest, I take this photograph of Mt Gudgenby. 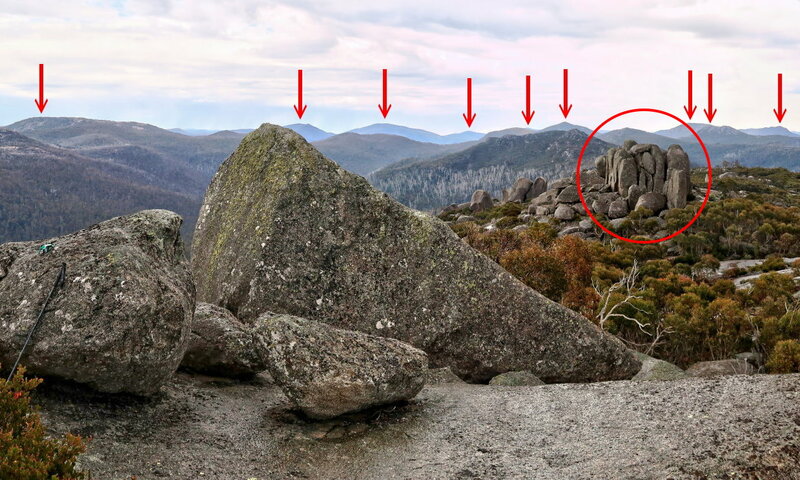 - Right red arrow: The pile of boulders I tried to climb ... Refer to photos #34 / #37. 4 Yankee Hat Carpark is somewhere behind the trees and can't be seen from here. 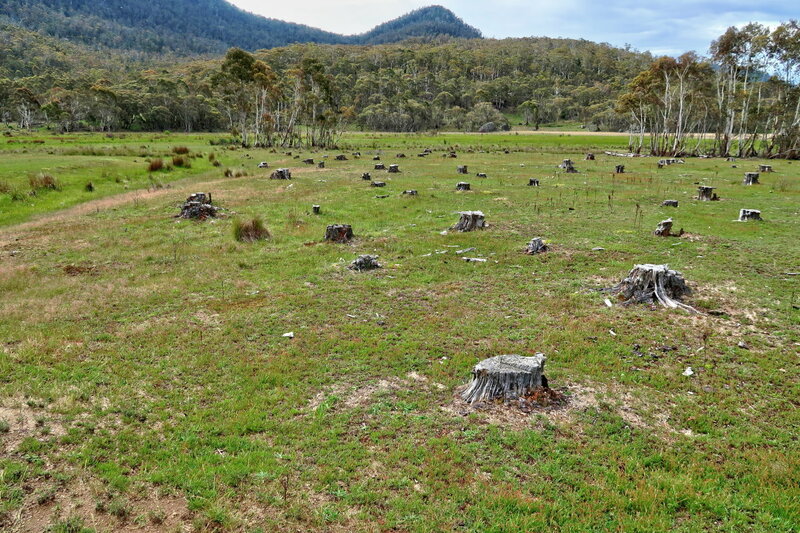 44) Tree stumps dotted the landscape ... a reminder that this area used to be a farmland. 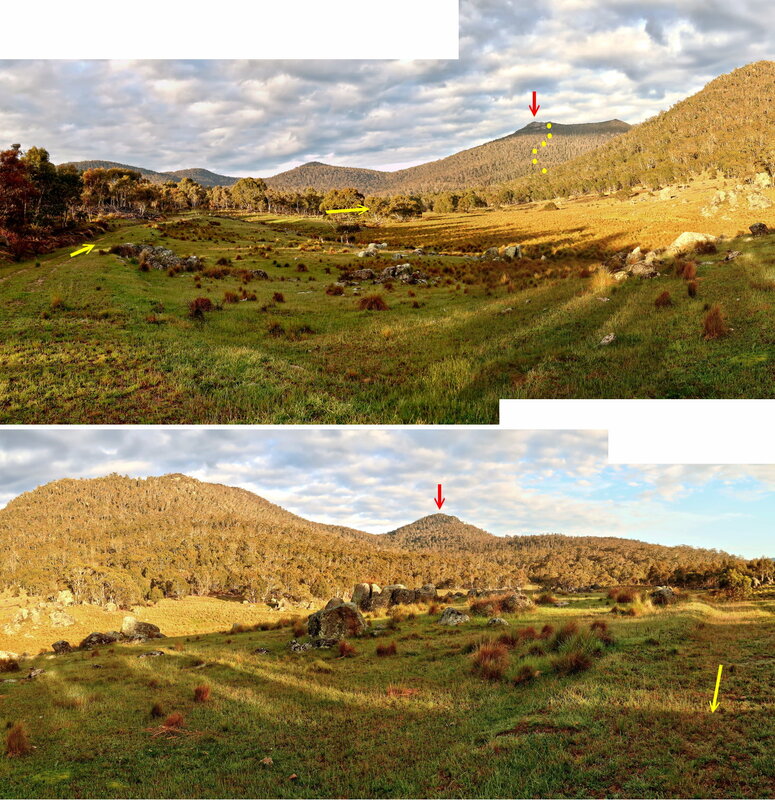 It is now part of Namadgi National Park. - The pyramid-shaped mountain in the background is Yankee Hat. 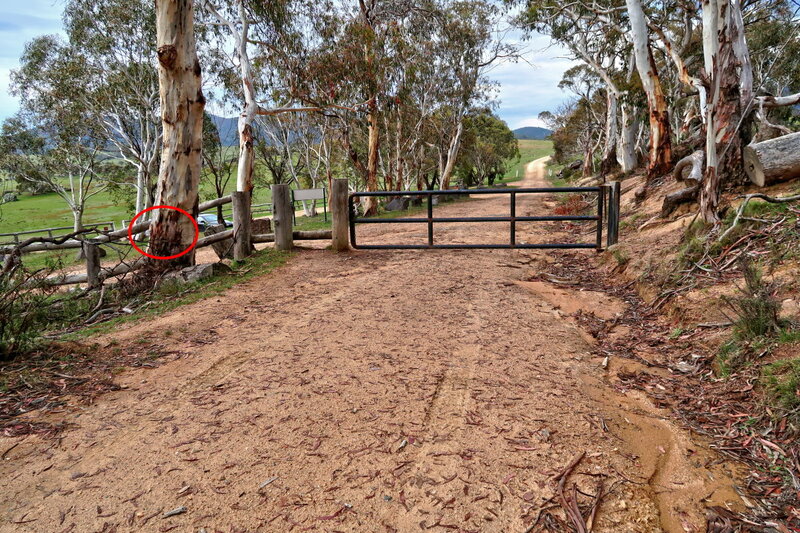 - Yankee Hat Carpark is on the left side of the road, immediately after the locked gate. - Red oval: View to DH's car is blocked by the tree trunk there. 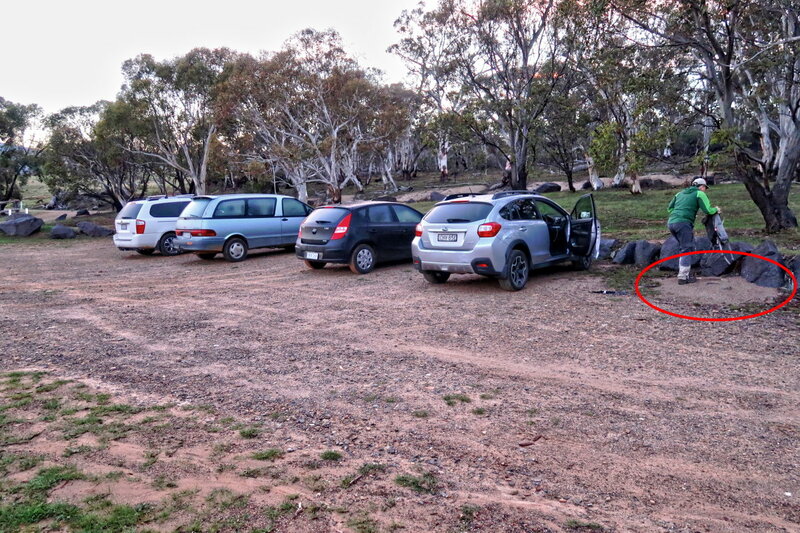 - The black car to the right of the red oval is the same black car in photo #1.